The Martinique Garden Gazebo – rectangular 4.3m x 2.995m reinforced Grey powder coated frame with galvanized steel connectors. Featuring Bronze 6mm twin-wall polycarbonate roof panels with an integrated gutter system. The Martinique provides a cost effective and simple solution for your outdoor area. Simple 2 person DIY assembly with pre-drilled profiles and pre-cut panels. Optional curtains are available. 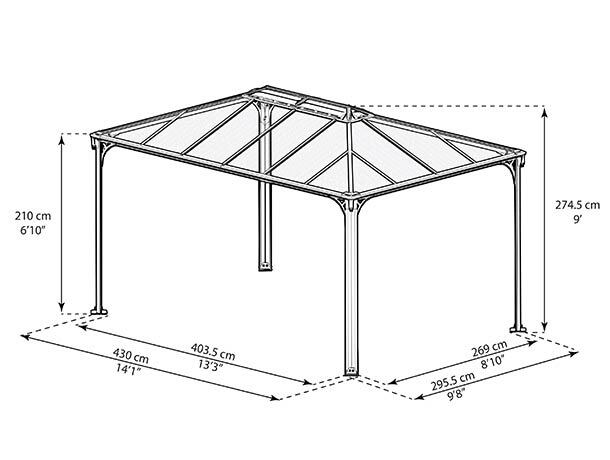 The Martinique Garden Gazebo 4.3m x 2.995m is a free-standing structure with an elegant top vent that allows air flow. Grey powder-coated aluminium frame with Bronze twin-wall roof sheeting gives 99.9% UV protection. Integrated rails and hangers are included for adding curtains (optional extra).